. : Publication date :: Reads: 6568 :: :: :. 2006 so far seems to be a good year for OutHere records, the Germany based African urban music label. With two newly released compilations, their catalogue moves away from strictly hip hop into different musical angles, though the link with the hip hop loving crowd is always there. From his spot carved out among shoe boxes full of new releases and demos (waiting to be moved to the all-new African hip hop foundation office), Juma4 reviews the two new cd's Lagos stori plenti and African Rebel Music. 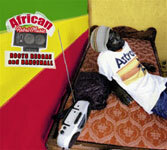 Last year on African Hip Hop Radio we already presented a few tunes from the African Rebel Music album. It is among only a handful of African reggae compilations that were released on the international market since the Black Star Liner compilation came out in 1983, with mostly Nigerian classics such as 'Fire in Soweto' by Sonny Okosun. On African Rebel Music, a larger part of the continent is represented, from Mauritania to Zambia and Senegal to Uganda. Needless to say, since 1983 a lot has changed on the production side. Stylistically you may still encounter the roots reggae that was popular back then, but many artists have embraced technology and they flow over synthesized beats. This compilation looks for those innovations. 'Bad boy' from Mauritanian group 994 Crew and 'One vibe one flow pt. 2' by Bantu featuring PBS are just two of the many good examples. Listening for the first time, it doesn't seem like there are any particular tracks that will stand out among the best of reggae/dancehall, but some tunes need their time and kind of grow on you, such as 'Wouty Zion' by Baay Sooley ft. Carlou D, produced by the late Country Man from Senegal, and the roots track 'Tonton d'America' by Tiken Jah Fakoly from Ivory Coast, who stands among Africa's biggest reggae stars, with a following in France. There are also some genuine reggae/hip hop cross-overs such as 'Handsome' by Tanzania's Dully Sykes and 'African' by H2O featuring Zubz: all are originally hip hop emcees. That Lagos is an entirely different 'stori' from what has been going on in the rest of the world, may be no secret to you. 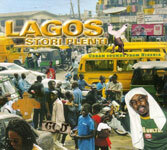 Even those who have never been to Nigeria have been able to sample many of the names on the compilation 'Lagos stori plenti' in the show that one of the artists, Mode IX, did for African Hip Hop Radio last year, or you may have picked them up in the reports by our correspondent Harry Okoh. OutHere managed to go beyond a mere collection of hit tunes by carefully picking tracks that give an outsider insight into Lagos' society, and by including extensive liner notes which add a much needed explanation to typically Nigerian phenomena such as '419' (the act of extracting large sums of money from wealthy people abroad by letter or e-mail). The latter is the topic of a song here ('419 State of Mind' by Modenine), is also touched by another (the hilarious 'I am a Nigerian' by Terry da Rapman) and then there is still JJC who performs with his 419 Squad. More parallels across the cd: 'Mr President' by African China and 'Letter to the President' by Eedris Abdulkarim (yes, that's the guy who got into an argument with 50 Cent over a plane seat). Other Nigerian hip hop regulars include Ruggedman, the Germany based Bantu and Weird MC who spends time between UK and Nigeria. If you're new to Nigerian modern popular music: do not expect loads of Afrobeat sampling, percussion heavy tracks on here. The hip hop tunes presented here lean on pretty straightforward beats and really survive by the lyrical excellence. The beat to 'I am a Nigerian' is a parody of Eminem's 'My Name Is' and uses the same melody, which in Eminem's version was sampled by Dr Dre from an old Labi Siffre record! But on the Nigerian version all this has been replaced by keyboard sounds. A few artists have gone further in developing a distinctly Nigerian musical backdrop, such as Bantu who drifts away quite far from hip hop as we know it, bringing in heavy Fuji influences to create an amazing tune. 'Give me a chance' by Nutty & Wharfy drifts between dancehall and soca. 'Niger Delta Jam' Most artists use Pidgin English which makes for an intense listening experience if you want to follow the story lines, but luckily there are short translations in the liner notes.